Lately I’ve been think a lot about mood. The other day I was in such a bad mood, snapping at my children and feeling irritated by everything. This continued for most of the evening and I went to bed grumbling under my breath much to the relief of The Husband! The next morning I woke up feeling fantastic! I felt almost euphoric, walking easily up the corridor and smiling at my bemused family! Was this dramatic U-turn due to a good nights sleep and an improvement in physical symptoms, therefore a reaction to MS or was it a symptom of MS in its own right? This got me thinking about organic mood changes caused by lesions on the brain and how they affect how our personalities cope with the onslaught of MS.
I’ve always been a “glass half full” type of person. I come from a long line of strong women who don’t “do” depression! I was always taught to “pull yourself together” growing up and I think this has taught me not to take myself too seriously, giving in to the self indulgence of misery! Having said that though I’d be a liar if I didn’t admit to feeling blue sometimes. When I feel like this I tend to enjoy wallowing in misery for a few hours before remembering the good things in my life and pulling myself together! MSers on twitter and the MSpals Facebook page talk about dramatic mood swings from despair and irritation during particularly bad episodes to elation, euphoria and hope when symptoms improve. 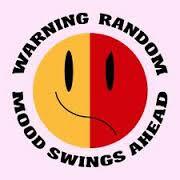 Are these mood swings another symptom during a flair up or a reaction to worsening health? Some say medication can affect mood, others say diet has an effect. I’m beginning to think its such a complex issue that we will never really understand it. Women also have the added effect of changes in hormone levels playing havoc with symptoms and mood once a month. I’ve taken the drastic step of having a coil fitted to help with this and I’ll write separately with the results! I try to snap out of negative feelings by keeping busy with work, writing and creating opportunities for myself. I find happiness where I can and am ridiculously excited about my decorating being done while on holiday, for example! I socialise as much as possible and keep up with my friends. Sharing the ups and downs of other peoples lives can give perspective to your own problems and I realise there’s always someone worse off than you! I’d be very interested to hear from other MSers about this. Have you noticed what affects your moods? Have you got tips for staying positive? Impossible not to remember the episode when I kicked a pigeon like a football whilst on holiday in Norway. Great example! Thanks for your comment! What did the poor pigeon do to deserve that! Like you I have always been a half full cup person, but as the years have gone by and the Ms progresses, I have found I have been getting more low moods. I try to keep this to myself and as a result, have found I am less social than normal, but I have taken a conscious decision that I will be more social this year. Life is too short and I want to make the most of it. Thanks for your comment! 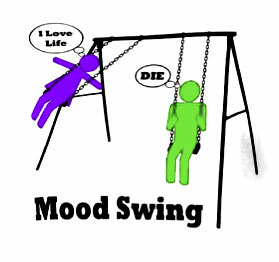 My mood fluctuates depending in my symptoms too! Maybe you need to talk to people more instead of keeping it to yourself? ?